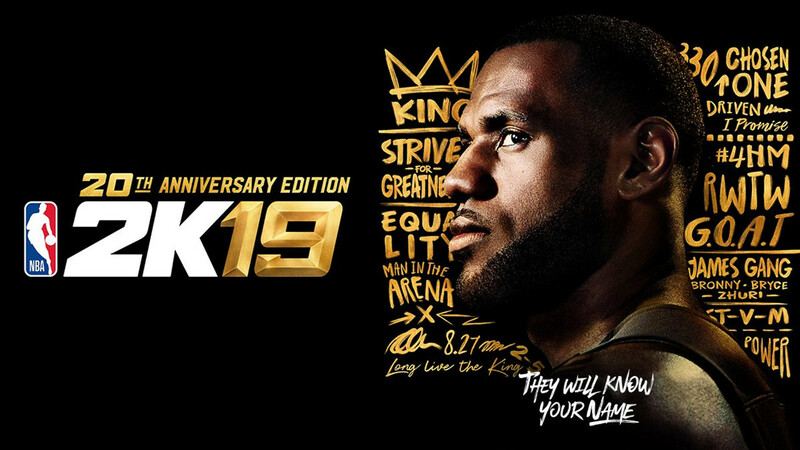 The second post-release patch of substance for NBA 2K19 went live today. While the previous one was primarily just to make critical fixes, this update reduces the success rate for steals (widely seen as problematic since release), implements the new shot clock reset rule for this season, updates of jumbotrons for two teams, and provides a number of other improvements in addition to more fixes across the various modes in the game. ♦Updated jumbotrons in both the Thunder and Trail Blazers arenas to match the real-world changes made there. ♦Nike athletes will now wear the official NBA arm sleeve containing Nike Swoosh and NBA logo. Non-branded arm sleeve is still present for non-Nike athletes. ♦Users can now set a ‘Preferred Shorts Length’ in the Gear/Shoes category when creating a player. The shorts length will then be applied when applicable. ♦Implemented the newly approved NBA rule that resets the shot clock to 14 seconds following offensive rebounds. ♦Reduced the effectiveness of on-ball steals, especially for low rated defenders by implementing the following: increased foul chances for body-to-body contact, increased ball security after rebounds when both hands are on the ball, introduced a cooldown when attempting too many steal attempts in a short amount of time, more mistargeted steal attempts for poorly rated players. ♦Fixed a soft hang where an inbounder would get stuck in an off-ball deny animation, preventing him from being able to check the ball. ♦Reduced injury wear and frequency for long quarter length games. ♦Fixed a case where the ball handler would sometimes get stuck in a double team animation after he had lost the ball. ♦Fixed an issue that was preventing up and under layups from playing properly under the basket. ♦Changed the color of the Takeover rebounding reticle for Glass Cleaners to make it easier to see against darker court floors. ♦Slight reduction in the effectiveness of pass lane steals that are not manually triggered. ♦Adjusted shot contest animations to make them more responsive against perimeter jump shots. ♦Adjusted the key zoom camera settings for 2K Low and updated some Broadcast camera angles to more accurately reflect their real-life camera locations. ♦Changed logic for Defensive Stopper badge to apply against opponents 1 position away from defender’s natural position or when matched up with someone within 3-inch height difference. ♦Shortened several pass flinch reaction animations to improve responsiveness. ♦Bench actors will no longer twitch badly when an injured player is helped off the court. ♦Fixed artificial speedups and reduced defenders clipping when transitioning into hip rides. ♦Reduced the frequency of defenders bodying up ball handlers into back court violations. ♦Reduced clipping that could sometimes happen when two players were fighting for rebounds. ♦Increased the speed at which a defender can move while in hands-up. ♦The Gatorade Reaction Drill will now provide badge points upon completion. ♦Addressed a case where the user would encounter a visual issue where an endorsement check appeared blank (even though the funds were properly added to the account). ♦The Dunk Contest ‘voting race’ will no longer appear during in-game presentation after the All-Star break. ♦Your MyPLAYER will now represent the proper team in the Rising Stars Challenge (Team USA or Team World) during All-Star Weekend. ♦Players who are 6’7 will now have their proper Lateral Quickness attribute. ♦Fixed an issue where the rotation would rebuild when the user attempted to adjust their own minutes (once this perk is unlocked). ♦Fixed a case where the All-Star Captain story scene would hang when both captains shared the same first name. ♦The Daily Spin prize wheel experience has been improved in the Ante-Up environment. There is now a second exterior door that leads you to a room with a number of prize wheels. This will enable you to more quickly get your free rewards each day. ♦Users are now able to place text/logos on the sleeves of hoodies/t-shirts when creating Crew uniforms. ♦Improved visual fidelity with the Neighborhood football. ♦Fixed an inbounding exploit that could be used during competitive games in the Neighborhood. ♦The Trivia app is now usable inside your MyCOURT. ♦Addressed a case where a player could turn themselves invisible by equipping a select compression shirt. ♦Improved camera angles when playing in the far courts in the Under Armour cages area of the Neighborhood. ♦Finger items should now properly show up in the closet when only a single finger item is owned. ♦Kinesiology tape should now properly draw on other players when viewed in the Neighborhood. ♦Fixed an issue where VC Sports Management (your agent’s office) would briefly appear closed when quickly approaching it. ♦Fixed an issue in Ante-Up where select members of a squad would experience loss of game control after losing a squad game. ♦Fixed a display issue where some users were reporting that purchased tattoos were missing. They should now reliably appear for placement. ♦Addressed a rare case where the user would get removed from the tattoo parlor and would not have their clothing items re-equipped. ♦General improvements to the Dodgeball game experience. ♦Fixed an issue where players in Pro-Am Team and the Jordan Rec Center would sometimes show up in the wrong uniforms. ♦Crowd audio will now be audible during Pro-Am gameplay. ♦Gamertags, rather than MyPLAYER names, will now be drawn on the back of Pro-Am uniforms. ♦Season rankings for Pro-Am/Crews will now appear correctly upon entering the menu. ♦Simplified the goals for unlocking the Auction House such that users now need to only participate in a Triple Threat Online and Unlimited game rather than win one of each. ♦Added the ability to clear the notification flags from inside the Collections menu. ♦A Dynamic Duo overlay has been added to the pack reveal flow, in order to make you aware of Duo combos as you receive the cards. ♦Updated overall rating formula when viewing team lineups. ♦Corrected a display issue where a player’s attributes were not shown as boosted when properly Duo’d with his duo partner. ♦Dynamic Duo icons will now visually animate when placed in the same Triple Threat lineup. ♦Simulated stats will no longer count as accumulated stats for cards when playing challenges. ♦Added the ability for users to override who the game has selected to be an All-Star with selections of their own. ♦Improvement to the MVP, Most Improved Player, and Rookie of the Year award selection logic. ♦Fixed an issue where the player ages in historic draft classes would display as invalid numbers. ♦Team Card menu informational pages previously missing in the MyLEAGUE Online experience have been added. ♦To add to the intrigue, you will no longer be able to sort by overall rating during the Pre-Draft Workouts and Rookie Draft time periods. ♦All-Star Weekend events are now properly scheduled when starting a new Start Today mode. ♦The results of League Meeting voting can be reviewed upon completion in ML Online. ♦Addressed a case where cut/waived players weren’t properly counting against the cap in MyLEAGUE Online. ♦Fixed a hang that would occur when the number of players required to be selected during the All-Star Draft was changed to 13 via a rule change. ♦Fixed an issue in MyLEAGUE Online where the finals of the Draft Lottery tournament would sometime get scheduled in the past. ♦Addressed a hang that could occur when attempting to review the Expansion Draft/Player Protection results after either event is complete.